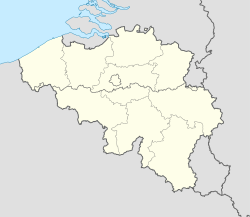 Grobbendonk (Dutch pronunciation: [ˈɣrɔbə(n)dɔŋk]) is a municipality located in the Belgian province of Antwerp (Dutch: Antwerpen). The municipality comprises the towns of Bouwel and Grobbendonk proper. On January 1, 2006, Grobbendonk had a total population of 10,747. The total area is 28.36 km² which gives a population density of 379 inhabitants per km². The official flag of Grobbendonk was adopted in 1989. In terms of heraldry, the flag is quartered, I and IV argent, three hills vert, a bird sable (specifically a raven), II and III gules three fleur-de-lis argent. The house of Ursel is still lord of Grobbendonk, owner of the Heerlijkheid. The heerlijkheid was in 1545 property of Erasmus II Schetz, the first Baron was his grandson Antonie II Schetz, Baron of Grobbendonck. The next generations were created Count of Grobbendonk, amongst these descendant duke of Ursel who was herederuty Count of Grobbendonk.